My office mate Elli attended a talk I gave recently about the work that my family and I are doing to restore a salmon run on Washington state’s Olympic Peninsula. Elli had heard a little about the Tarboo Creek project before that — enough so that, long before the presentation, her first question on Monday mornings was about what we’d done the previous weekend. My answers didn’t vary much: planted native species, cut Himalayan blackberry, built trails. A few weeks after that talk, though, she turned the tables. “Guess what we did last weekend?” she asked. Elli and her husband, Roddy, are working on their first house. They’ve refinished floors, replaced rotted pieces of wood decking, added a skylight, repainted everywhere, met the neighbors and started friendships. They are making their house a home. Elli has a 1-year-old daughter and a son who’s 3½. Thanks to that out-with-the-old, in-with-the-new weekend, Libby and Jimmy will grow up watching native trees get taller — trees that they planted with their mom and dad. Someday they may play under them, climb them or just sit in their shade. But western red cedars can live 500 years or more. So those trees are more than a gift to her family; they are a gift to the future — a legacy. The tradition that Elli started that day runs in my wife’s family too. Susan is the granddaughter of Aldo Leopold, who planted native pine trees and prairie species on a worn-out, Dust Bowl-era farm in central Wisconsin. The Leopold family started that project in 1935; it was the first time anyone had attempted what we’d now call an ecological restoration. Susan’s father Carl Leopold and our son Peter lead a family walk along Tarboo Creek. Leopold wrote a book called A Sand County Almanac, about what he and his family were doing to make that 80 acres of abused farmland better. Most important, he tried to explain why they were doing what they were doing. His idea, which he called the land ethic, was that good people should demonstrate the same love, concern and respect for the land around them that they show to the people around them. Today members of that thinking community are joining people all over the world who are exploring new and creative ways to live a land ethic. There are as many answers as there are people. My cousins Barb and Andy Holtz, for example, farm in southeast Wisconsin. Back in the 1930s, Andy’s dad took a wildlife-for-farmers course from Aldo Leopold at the University of Wisconsin. Leopold asked his students to be stewards of the land they farmed and to consider fencing off 5 acres as a wild corner, unplowed and unpastured. Barb showed me “Aldo’s corner” during a visit to the Holtz farm last month: the spot that her father-in-law had fenced off when he returned from the war in the 1940s. Then we toured areas on their back 40 where she and Andy are removing dense stands of invasive buckthorn to restore a beautiful bur oak savanna. There are a million other ways to live a land ethic. 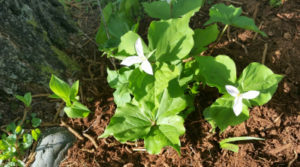 Our friend Dennis converted his backyard into a butterfly and bee garden; our friend Sievert hunts and forages to supply as much of his own food as he can manage. Friends from New York City buy food directly from area farmers and take public transportation as often as possible. We once rented a room from a family in Manhattan’s Chelsea neighborhood that grew many of its own vegetables in a rooftop garden. And no matter where we live, we can all turn our thermostats down a degree or two in winter, or drive a smaller car, or live in a comfortably sized apartment or house. When we each do a little, we all get a lot. In my family, Susan keeps bees, and she and I spend many of our nonwork hours growing fruits and vegetables in our yard and freezing and canning and drying them. But our Tarboo Creek project is probably the most rewarding way we’ve found to live a land ethic. Susan and I met at the Leopold farm in Wisconsin, and we’d always dreamed of doing a restoration project of our own, as a family. Later that walk, we check out a redd, a salmon egg nest in the creek gravel. Photo by Natalie Forbes. Then, in 2004, we found Tarboo Creek. The 18 acres we bought to restore contained the most badly degraded section of that little stream; the segment that flowed through our land had been ditched in the early 1970s. By the time we arrived, water was running through the straightened channel like a fire hose. The bed was being scoured, and sediment was careening downstream. 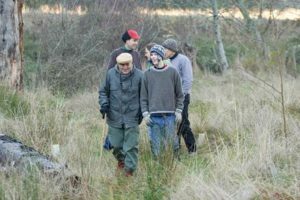 Fortunately for us, a community of individuals and organizations had started to form around the idea of working on the entire 7½-mile-long Tarboo Creek and surrounding 7,000-acre Tarboo Creek Watershed. The effort was spearheaded by a local conservation group called the Northwest Watershed Institute, which had a small grant to fund two weeks of excavator time — enough to dig the creek out of the ditch at our place, which was the next project on its list, and into a new, serpentine channel (a process called remeandering). Early the following spring, we started planting trees along the new banks. Fourteen years later, most of Tarboo Creek’s main channel and major tributaries have been remeandered, reforested and protected by conservation easement. River otters, beavers, minks, cougars and eagles, all of which had disappeared along with the salmon, are back. 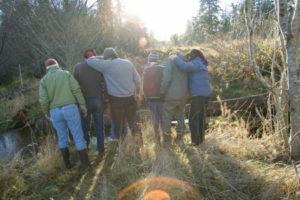 The community that we joined has grown to include a thousand schoolchildren and parents, who have planted trees somewhere in the watershed; a growing array of government agencies, private landowners and tribes that have provided expertise and financial support; and a long list of friends and neighbors who have removed invasive species, planted natives, counted returning salmon and thinned crowded forests. Our family is a pixel in a painting. As rewarding as these successes have been, the work that we’re doing along Tarboo Creek will never be done. But then, neither is an ethic. It’s up to each of us to find a way of living the land ethic, as my office mate Elli did. But the central idea remains the same: treating the land, and one another, with love and respect. These are the values that bring purpose, meaning and joy to our lives. They are also values that endure — that we can pass on to our children and grandchildren. Make every day an Earth Day. Take a stand, among a million points of light. It feels good to be one of them. This was first printed in houzz magazine, April 22, 2018, in honor of and with inspiration from Earth Day.